The State of New Jersey has few attractions to boast about that feature the marine world that intrigues so many of us. The oceans are one of the most intricate and attractive ecosystems in the world and a great many people want to dive below its surface (many more prefer to do this without getting wet!) So, where can a New Jersey resident or visitor experience this awesome world? 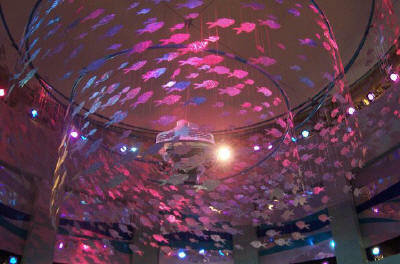 The newly renovated and designed Adventure Aquarium (formerly the NJ State Aquarium) is one of the best places to start. Adventure Aquarium is now open with a new building, new exhibits, and a new state of mind. I have to admit, being a frequent visitor of many aquariums, I am not easily impressed. However, the exhibits here will surprise. They are diverse, well planned, and beautifully implemented and combine useful (and scientific!) information with visual stimuli. The first exhibit that draws the attention is Irazu Falls – an Amazon rainforest exhibit. A two story waterfall gives way to over 400 gallons of Amazon River habitat. Look closely to see many freshwater Catfishes and even a Stingray or two. Of course there is the Ocean Realm where you experience 760,000 gallons of saltwater (can I have this at home? Please?) through two wall-sized windows. See Sea Turtles, BlueFin Tuna and Herring swim.... and be in awe. Outside you’ll experience Seal Shores and Penguin Island where you can watch African Penguins swim and play, and even catch a seal feeding show! 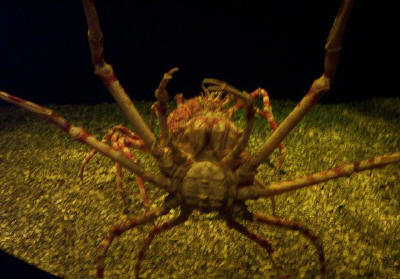 Back inside, the tour takes you to my personal favorite exhibit in the Aquarium: The Creature Lab. This exhibit is Adventure Aquariums equivalent to a reef and bizarre creature exhibit. Here you’ll experience everything you have in your home reef (and everything you wish you could have!) You’ll meet electric eels, flashlight fish, batfish, and see a fairly large anemone and Clownfish tank, plus many reef tanks brimming with gorgeous corals that make a lot of us drool. For the little ones or us adults that wish to get their hands wet, go on over to the Touch-a-Shark area or the Meet a Creature exhibit. Here you’ll be able to touch Dogfish Sharks and Stingrays and hold a Sea Star or Urchin. Behind the impressive exhibits, I learned that there is much more to this aquarium than meets the eye. 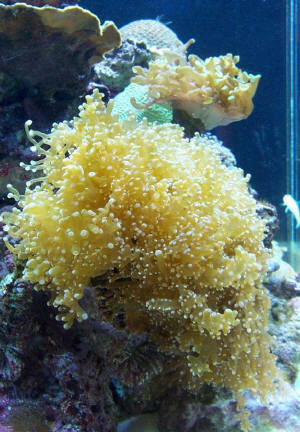 Anyone participating in the adventure of having your own marine aquarium knows that there is much preparation for the ultimate well being of the critters you keep. Even though Adventure Aquarium is large-scale, it is no exception. I had the pleasure of being put in contact, through the Public Relations manager Mr. Bill Larson, with the Curator of Fish and Invertebrates Mr. Marc Kind. Even though he states that reef keeping is a small portion of what they do at the aquarium, ultimate care is still taken in the feeding of many reef animals. Quality flake food, Cyclop-eze, small krill, Mysid Shrimp (both live and frozen), minced mussel/clam, and Artemia nauplii (in small quantities because excess can cause unwanted aptasia) are used in feeding. 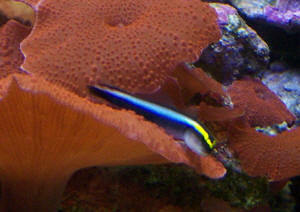 Target feeding is rarely used because of the size of the exhibits, but when needed (as in anemone tanks) mussel/clam or slurry of raw seafood and supplements are used. Their bony fish diet is just as meticulous and consists of grade A restaurant quality Smelt, Herring, Mackerel, Capelin, mussel, squid, large and small krill, and mysid shrimp. The security officer that I met said that the fish and vegetables that are delivered for the animals here look better than what she buys for her family! In keeping with an education theme, you can even view where some of the smaller foods are prepared for the livestock. Here, view large containers brimming with phytoplankton cultures and Artemia hatchlings. They also culture Nannochloropsis algae, rotifers, and mysid shrimp. Very neat to view in its own right. As we all know, water quality is one of the biggest concerns and most important topics in keeping a marine system. They use RO/DI water mixed with Tropic Marin saltwater mix and perform water changes every three weeks to a month depending on the protein skimmer and bioload (image that large of a water change!) pH, Salinity, Nitrate, Calcium, Alkalinity, Phosphate, Silica, Iodine, Magnesium and Strontium and are tested for. Mostly Kent products are used and are dosed weekly, including Essential Elements, Coral Excel, Coral Vite, Super Buffer, Turbo Calcium, Turbo Strontium, Kalkwasser (with a dosing pump giving 3-5 gallons per night). In addition they make their own Lugol's solution. It’s very humbling to know that we, as marine hobbyists, do all the maintenance, feeding, dosing and so on that a professional aquarium does. It shows us that we are indeed on the right path to providing our critters with the utmost of care that they need to live and flourish. We each do a little part to bring this amazing world into our homes and ultimately save a small piece from destruction. Overall, a visit to Adventure Aquarium is well worth it – either to see the maintenance that we all do at home at a very large scale or to just sit back and observe the various exhibits (some you won’t want to leave!) It’s a day hobbyists and their families will absolutely enjoy!